The apartment is located on the third floor in the family house, in an ideal position, only 100 m from the beach, and only (20 min. walking to downtown). In addition, is positioned in a residential area surrounded by greenery in the heart of the park-forest Marjan. It distance 5 min. from the beach. place in front of a house. The apartment is renovated in 2008 year. It is ideal for families and individual guests. I was born in Split in 1970. I lived pretty much all the time in this city. Here I have finished all schools, elementary school, the medium of Medicine, and the Faculty of Chemistry. This house is the house of my youth, where I was born, where I spent my teenage years and where I still live in. Lately it was somewhat renewed. Obviously, this vacation home has a special meaning for me, and I'm very happy of the fact that the apartments in it, fully satisfy my many guests, and find that in the whole very welcoming and attractive. The house is surrounded by greenery, on the southern slopes of the hill Marjan. The highlight of the apartment and 'the panoramic view of 360 degrees. Despite being only 20 minutes (walking) from the city center ', seems to be in tranquility' of the countryside, just a 2-minute walk from the beautiful pebble beaches suitable for children and adults. On the south side of the house is the garden at the disposal of the tourists. The highlight of the apartment and 'the shaded area with table and chairs. lounge chairs, outdoor shower, barbecue and wood-burning all surrounded by grass and flowers and fruit trees. In front of the house there is a private parking for 4 vehicles, assured of ambi two guest apartments, including the owners. Peaceful, spacious with an amazing view. We thoroughly enjoyed our stay and appreciated our host who helped us even though we arrived near 12 am with our flight delays. very clean and large apartment close to restaurants but I thought we would have a view of the water. Even though the sea was nearby we didn't feel it was within walking distance like I thought it would be. But for the price it was fine. takes one about 20 minutes to walk into main area of town. Great view from nice apartment. We had a great vacation in Davors nice and bright apartment. The apartment is 5 min. walk from the beach, and 20 min. walk from the old town. We were 5 persons in the apartment, and we didn't have any problems or issues with the space because of the 2 big terrases and 2 bedrooms. Davor was a great host. He was always nice and helpfull if we had any questions about our vacation. We would very mouch like to come back to Davors place. Many thanks for the wonderful stay we had in Split. The apartment is fully equipped, very well located in a quiet neighbourhood and with a great covered terrace with fantastic views over the ocean. We loved it! We came by car, so no problem to get anywhere (and parking available in front of the door), but even without, the apartment is a 30 min stroll alongside the beach to the city center. And it has all the conveniences you can''t find in the very city center. Davor is a great and helpful host, a good example of Croatian hospitality!" "We had a really great time in this appartment. It is very clean, quiet and well equipped. The highlight is the beautiful and very big terrace. The sea is very near and you can easily walk there. I would definitely recommend this appartment." 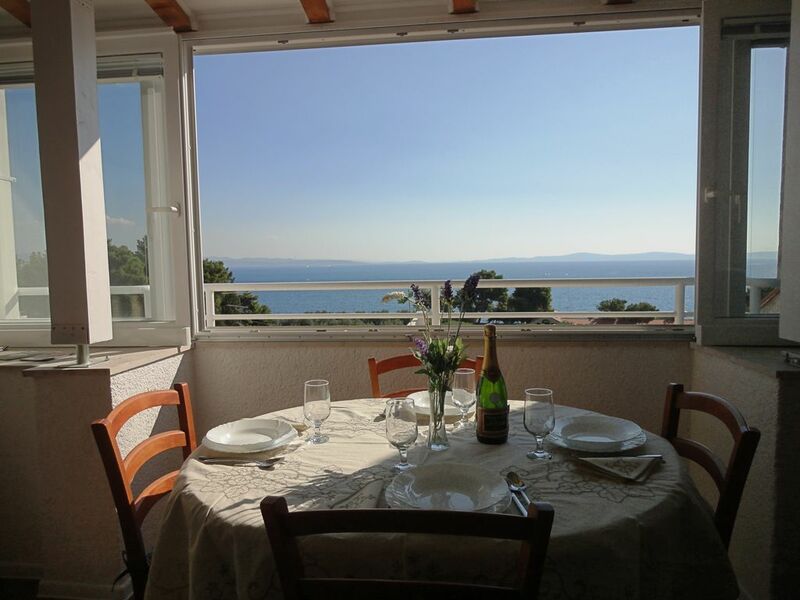 The apartment has an excellent location for excursions in the main city of Split and very close to ferries to the other islands. The host is friendly and helpful. My only constructive feedback would be that the apartment could use a bit of renovation/modernization (kitchen and bathroom mostly). Other than that, it is an ideal home base for your Croatian vacation. If you are arriving by airplane, from the airport leads the main road till the entering in the town. After entering the town follow the idication; Tunnel Marjan in the quarter Meje. After exiting the tunnel, turn right at the second T-crossroad, then continue to drive straight for 700 m, and then after a mini-market turn right uphill. Nearby apartment there are beaches with cafes, seafront promenade, many restaurants and pizzerias, park for entertiment, tennis court, jogging and cycling trails, and many other sports activities. In addition in the immediate vicinity there are the gallery of the world known sculptor Ivan Mestrovic, and the Museum of Croatian archaeological monuments.